What is Methadone? What is Methadone used for? Methadone is a Generic name for a synthetic opioid drug. This narcotic drug works by changing the way how brain and nervous system respond to pain. It is also used to relieve severe pain. It is used to reduce withdrawal symptoms in patients addicted to heroin, morphine, fentanyl, hydrocodone or oxycodone and different narcotic drugs without causing the “high” which is associated with drug addiction. So, it is used for detoxification or maintenance therapy of an opioid drug addiction. Methadone’s abstinence syndrome is qualitatively similar to that of morphine, however it differs in onset of action which is slower, the course is more prolonged, and the symptoms are less severe. 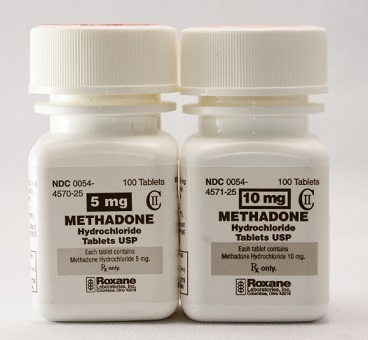 Methadone also contains depressant action on the cough center in the brain and may be used to control intractable cough which is associated with terminal lung cancer. Methadone comes in the form of a tablet, dispersible tablet, concentrate solution, and solution to be used by mouth. In the form of tablet it is available in doses of: 1 mg, 5 mg, 10 mg, 25 mg and 40 mg. It also comes as an injection. It is also available on the market as Brand names Dolophine and Methadose. FDA approved methadone in 1947. Data suggest that methadone is one of the world’s most addictive drugs. Even some individuals respond well during methadone replacement therapy, others experience undesirable side effects such as: sedation, dizziness, fatigue, muscle weakness, hallucinations, digestive problems and heart problems. For these reasons many patients discontinued methadone and want to fully recover and clear it from their systems, which is for certain the best option and possible only under their doctor supervision. How Methadone works in the body? Methadone works as an agonist of mu-opioid receptors in the brain. Mu-opioid receptors agonists are known to make production of endorphins and enkephalins, leading to effects such as: pain relief, physical relaxation, euphoria and pleasure. Results of these effects in patients are that many individuals replace one addiction for another, becoming equally or in some cases more addicted to the methadone compared to the original drug which is attempted to be abrupt such as heroin. Some findings also indicate that methadone works as an antagonist at the NMDA receptor. However, the contribution of NMDA receptor antagonism to methadone’s efficacy is unknown. It has been shown that NMDA receptor antagonists may produce neurotoxic effects in animals. Methadone’s therapeutic effects last up to 8 hours. After this time, drug is still in the body. Most findings are in conflict about this drug’s average elimination half-life time. Results are different and include estimated time of: 24 to 36 hours, 13 to 47 hours, 15 to 40 hours, and 8 to 59 hours. This means that the elimination half-life time of methadone is very-variable between individuals. Since the 8 to 59 hour half-life has the longest range it is used for assessment. According to this data, 50% of the orally administrated methadone will be cleared from the body within 8 to 59 hours. So, it will likely need between 1.8 days to 13.5 days for complete clearance of methadone from your body. These results are estimated only on average range for healthy individuals; certain people may take longer than 13.5 days to eliminate methadone and its metabolites from their system. Methadone’s effects usually last longer than effects of morphine, which is reflected in the detection time. The typical detection time in urine test is 7-10 days, considerably longer compared to 2-4 days for morphine. There are also some reports of who uses methadone for long-term, showing positive test for 10-30 days after their last use. Saliva tests are the easiest one to pass, with the detection time of only 24 hours. Methadone may also cumulate in hair. Detection time of methadone in hair is expected to be 90 days after last use. What factors may influence on how long methadone will stay in your system? In general, the greater dose of a drug person ingests comparable to their body mass, the longer it will remain in their system and vice-versa. Methadone is lipid-soluble substance that accumulates in fatty deposits of the body. That’s why persons with less overall body fat in their body will not accumulate as much methadone will clear this drug faster. Rapid metabolizers as a result of certain genes expression may eliminate methadone faster compared to “poor metabolizer”. It is unknown whether food or empty stomach may have an impact on methadone’s absorption, metabolism, and elimination. It is suggested that a food rich in high-fats may enhance absorption and increase bioavailability of methadone. Methadone is metabolized in the liver by different CYP450 enzymes but most notably with CYP3A4 enzyme. Persons with hepatic impairment may be unable to metabolize the drug as quickly as those with normative liver function. If your urinary pH is more acidic the faster is methadone clearance from your body. Highly alkaline urine in most cases will result in drug reabsorption before excretion prolonging the clearance of the drug. A long-term user of methadone will accumulate a far greater amount of methadone in their body, resulting in prolonged elimination times compared to infrequent users. Drugs that inhibit CYP3A4 enzyme tend to interact with methadone’s metabolism, leading to prolonged clearance time. Such drugs may include: Clarithromycin, Ritonavir, Indinavir, Ketoconazole or Nefazodone. On the other hand, drug such as: Carbamazepine, Phenobarbital, Rifampicin, Glucocorticoids, Modafinil and St. John’s wort may activate CYP3A4 enzyme, leading to reduced clearance time.